Generally bottom up approach, where the service implementation is done first and wsdl will be generated next, is not a suggested way of implementing a web service. In some cases where the service implementation class is already exists in the application and wants to expose it as web service then it is acceptable to go with bottom up approach. In this post, I would like to show how the web service can be developed in bottom up approach using the wsgen command. The wsgen tool reads an existing web service implementation class and generates the required JAX–WS portable artifacts for web service development and deployment. The wsgen tool can be used for bottoms-up approach, where you are starting from a service endpoint implementation rather than a wsdl. 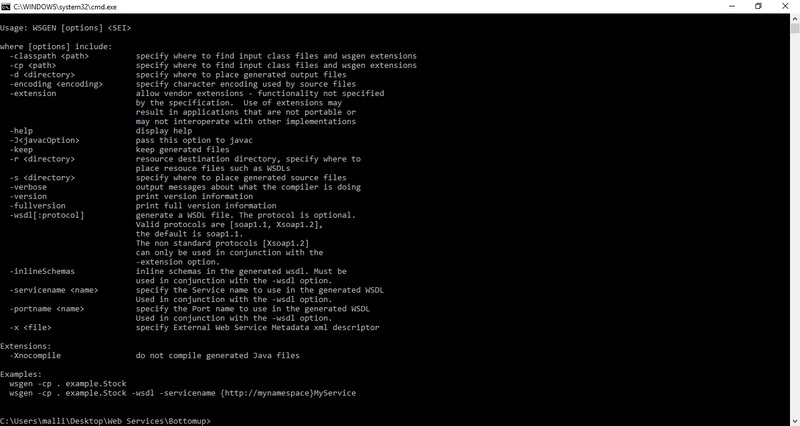 The generated JAX-WS artifacts can be used by both service and client implementations.